PANAMA CITY BEACH, Fla. -- From the tee at Camp Creek Golf Club, all you see is blue, green and the brown hues of native grasses and wetlands. No homes, no cart paths -- a rarity in public or even private golf, for that matter. The dogleg left, par-4 ninth is the no. 1-handicap hole at Camp Creek. Quiet, serene and still, Camp Creek is fit for prayer for those who pour their faith in golf. 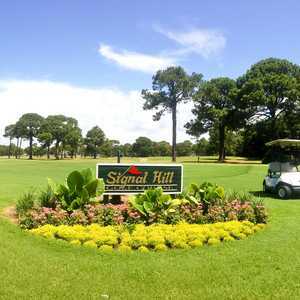 Natural vegetation lines the fairways and serves as a backdrop to the elevated tees and greens. The sugar-white sand in the bunkers contrast with the lush green turf. Camp Creek is all golf, it doesn't cater to real estate, and it really doesn't cater to all types of golfers. To appreciate Tom Fazio's work -- which includes 86 bunkers, a number of waste areas, numerous water hazards and large, difficult greens -- you have to have a little skill and some experience. There's nothing ordinary about Camp Creek, especially the scenery. Opened in 2001, Camp Creek has been on both sides of the private ledger. It's always served the nearby resort -- WaterColor Inn -- but it spent a few years fully private. That feel is still there. For the most part, it's rarely crowded, conditioning is superb, and the course features one beautiful hole after another. But as scenic as Camp Creek Golf Club is, it's anything but easy. At its longest -- 7,159 yards -- it has a course rating of 76.0, which is four strokes over par. Breaking 80 for good players is quite an accomplishment, and the course has represented one of the toughest qualifying sites for the U.S. Open and U.S. Amateur. The thing is that even one tee up, the rating is still 73.5, and it doesn't get a whole lot easier from the three sets of tees in front of that. The reason is the greens are difficult, no matter where you tee it up, and you can't miss fairways or greens, no matter what tees you play. "Once you get to the green, that's the hardest part," said Jaxon Hardy, Camp Creek Golf Club's director of golf. "Because Fazio tricks it up, it makes it tough to read the greens. You think it's going left, and it goes right." Hardy stressed, however, that it all begins off the tee. Although many of the fairways are generous, you have to find them, for the most part, to have a chance. And playing the right set of tees is critical. Only the best players should tackle this course from the tips because it does play long, and long approach shots into these greens are not manageable. Even at 6,689 yards, the course plays long for most, especially the par 3s, which average close to 200 yards. Fortunately, Fazio gives golfers sort of a warm-up hole with the first, a gentle dogleg-right par 4 that's only 371 yards from the back tee. The second is fairly short as well, but the course gets drastically more difficult after that. "Once you turn back into the wind on no. 4 (445-yard par 4), you've got some tough golf ahead of you," Hardy said. Indeed. The par 5s, though they're not drastically long, all have large water features and difficult greens. The ninth, the no. 1-handicap hole, is 444 yards and wraps around the lake. The 18th, the no. 2-handicap hole, is very similar. A case could be made for many holes being the course's signature hole, but the par-3 14th, the shortest on the course, is one of the most picturesque. With a peninsula-type green, it combines all the elements of the course's design. 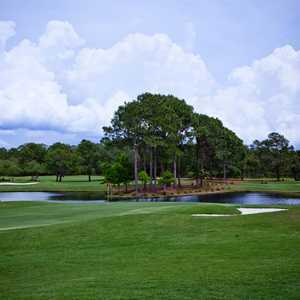 If you make a trip to the Emerald Coast of Florida, Camp Creek Golf Club has to be on the play list. It truly is one of the best golf courses in Florida -- public or private -- with a great variety of holes painted against a gorgeous natural canvas. Players should plan on making a day of it at the club. Managed by Troon Golf, the facility has excellent practice facilities in top condition, you'll want to get in plenty of practice before -- and perhaps even after -- the round. Lessons are available from the professional staff. The clubhouse is also inviting and offers a variety of food and beverage choices, as well as plenty of apparel choices in the golf shop.